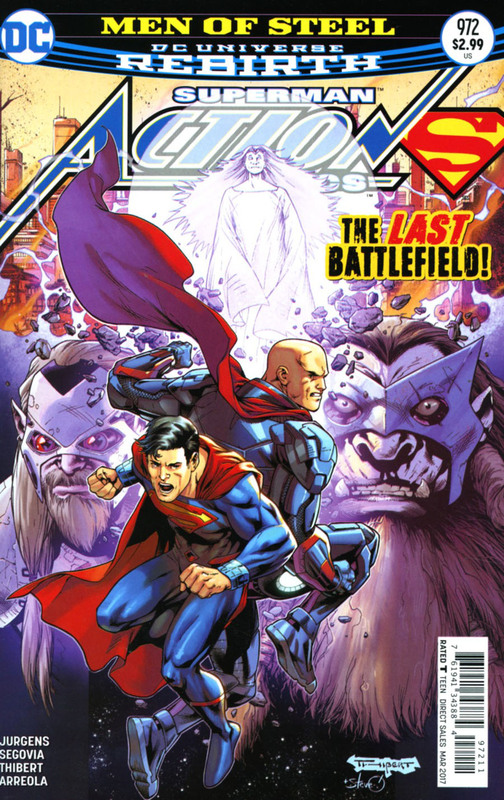 Lex and Superman engage L'Call and Zade in battle even though Superman's powers are fading. They retreat momentarily and Lex wants to use the Boom Tube from his Mother Box to take them home. Superman wants to settle this here and now because even if they escaped, L'Call and Zade would just follow them to Earth. Meanwhile Lois manages to get Other Clark out of Other Lois' apartment, though Clark is pretty sure Lois is lying to him. The battle on the other planet resumes but Superman convinces Zade to persuade L'Call to stop the fighting. L'Call uses his ability to see a person's future on Superman and this is enough to end the battle. 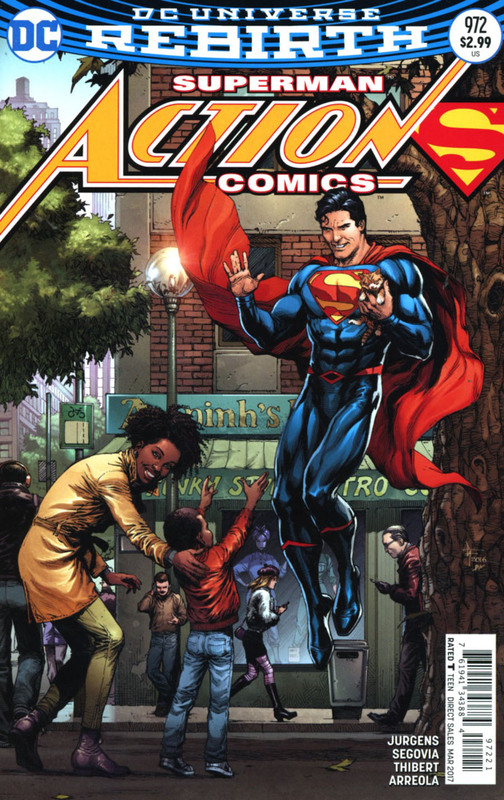 Superman and Lex return to Earth and make a fresh start now that both men see the other in a different light. Story - 5: This was a satisfying conclusion to MEN OF STEEL. Jurgens put Lex and Superman through their paces, so the drama of the piece was set to eleven for most of the issue. We also got a tense scene between Lois, Jon and Other Clark, which gave us a breather from the main story and continued that mystery quite nicely. This issue also served to cement my feeling on Lex Luthor taking on the Superman mantle. Unless Jurgens is throwing us a serious curve ball (which is always possible and usually welcome) this Lex, or at the very least Jurgens' take on this Lex, was genuinely moved by his Superman's death and wants to use his resources to be the inspiration he believes mankind needs. The twist in this issue is that just by watching Superman fight on without his powers and just by using his wits, Lex finally sees that the man he thought was an imposter is actually the real deal. I kind of wanted to write, "the real Steel deal" but that seems like a throwback to 1995. Most of the internal narration was from Lex and because of that we got to see Superman through his eyes. I liked that narrative trick. It was interesting to see Lex's opinion turn from believing Superman to be a liability to being impressed with his skills to trying to hand the New 52 Superman's cape over to him at the end. There's also the moment where Lex realizes that Superman must be from an alternate reality and that the Lex from that reality went over the line. I could go into the fact that this Lex supposedly went over the line but that's overly nit-picky. The scene at the end was a great moment, especially when they shook hands and declared a fresh start. It's going to seriously break my heart if this Lex goes bad. I never thought I would feel that way but Jurgens is making it work. Superman was amazing throughout the issue. While it was cool watching him make his way through the fight without his full powers it was his resolution to the situation that made me smile. The punching and the jumping and the kicking stops and the talking begins. Superman does have a straight-ahead manner when dealing with emergencies but it is just as cool to see him convince people of his position without having to punch things out. Jurgens continued exploring the theme of a person not being guilty of a crime they might commit and then turned that on its head slightly at the end by showing L'Call's visions of Superman's future. It was a nice one-two punch of playing with the philosophical dilemma of the story and giving the audience a hint at what's to come. This title keeps getting better and better. Jurgens has a lot of plates spinning at the moment but he is doing a fine job of keeping up the momentum and moving the story forward and giving us some great Superman moments as he does so. If that last page is any indication, those plates are going to keep spinning in the weeks and months to come. Art - 5: The splash page to this issue was an amazing way to open the issue. Both Superman and Lex look heroic and ready for business, which allowed the issue to hit the ground running. Speaking of running, I got a serious Batman and Robin vibe from the panel where Lex and Superman made a temporary retreat. The alien planet looked amazing but so did Other Lois' apartment. I love when an art team can make the other wordly and the real world look equally fantastic. There was a lot of great shadowing in this issue as well, which heightened the tension of the scenes on the other planet. Segovia and Thibert continue to be one of the stronger art teams on this title and it was nice to see them do the art for the cover this time as well. Cover Art - 5: I absolutely love the composition of this cover. It's a great mix of science fiction and fantasy. Superman and Lex look great and I like the faces of L'Call and Zade in the background with the robed character whose name escapes me serving to center the piece. Variant Cover Art - 5: It's Superman getting a cat out of a tree. There's nothing wrong with that. Gary Frank continues to produce fun variant covers.